Do you recognise the following quotes? 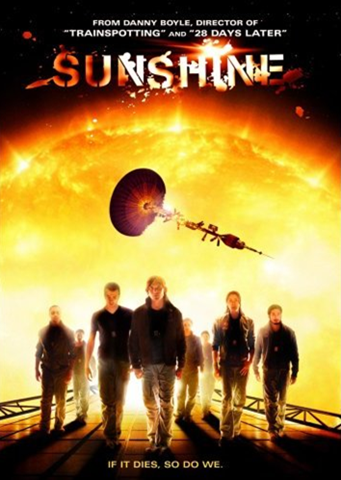 If you know the films that these quotes are taken from, then according to many of the film review websites, and most of the threads in the comments sections of film review websites, you have already seen “Sunshine”. Moreover, if any more amateur scientists get their knickers in a twist over the supposed science mistakes in this film, I will scream. Firstly, they complain, the sun is hot enough to melt them surely? Well, the film is about restarting the sun, thus it is not as hot as normal. Duh. Then, they argue over why the sun needs restarting. It needs restarting because it has been bonked with a QBall. QBalls are one of those super strange things scientists can’t explain in simple words, but have an unerring habit of coming up with a simple and cool sounding name for. Like “Branes” or “Super String” or a “Quantum Leap”. Listen people, a “Quantum leap” is the SMALLEST movement possible. Not, I repeat, not the largest. Look it up! Basically, if a QBall fell through our sun, it might have the effect seen in the film. It might not, but nevertheless; lets just hope one doesn’t pop by to say hi. Then the arguments get juicy. Wouldn’t it take more than the amount of material they used to restart the reaction inside the sun? No, it wouldn’t. Since the reaction is a run away system then with the right material you could start it with two inches of the stuff. But science aside, what about the story and performances? They are uniformly brilliant. The casting is especially good, with some of the actors that I have been following very closely for ages. Such talent as Hiroyuki Sanada, who was brilliant in The Twilight Samurai, and Michelle Yeoh, who always seems to look eternally young. In this film however it is another; Chris Evans who stands out in his part as the fantastically quick thinking Mace. A well written part that adds a needed depth to his character. What about the story? Well, I saw every single twist coming in time to wind up ‘Cesca by announcing them, but frankly they are handled with such aplomb here that I, and you, won’t care. This is a staggeringly well made film, a film by a master who ticks every box with a signature flourish that is a joy to behold. As for the look of the film, it is a revelation. Consider this, it only cost 40 million to make. 40! The execrable Die Another Day cost 142 million! Quite how they managed to create such visual splendor that hangs together so well with such a budget is simply mind boggling. So, yes it is derivative. However, it is not so high on scientific hokum as most suggest. (Consider the ‘science’ in Die Another Day, again!) It has brilliant directing, excellent acting and well paced suspense. It is a very good film. The ending. There has been much criticism of the final moments of the film. I consider it to be trying to answer a question many people have had. Namely, what would it be like inside an area where spacetime has gone up the ying yang? Like in a black hole? Would you still be alive and able to ‘see’ it? What would you ‘see’? Would it hurt? I personally like the answer found in Sunshine. I liked the answer a lot.